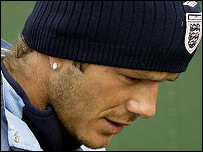 England football captain David Beckham kept his new look hidden under a dark blue woolly hat when he turned up for training on Monday. But the twisted ends of the series of small parallel plaits pulled tightly to his head still showed beneath the England team's three lions badge. The golden braids - known as cornrows - will be seen in their full glory later on Monday, when Beckham models the England squad's off-the-field Giorgio Armani outfits for the first time. Hairdressers across the country are expecting an influx of young men demanding cornrows. Beckham is the celebrity most men want to look like according to a survey of 300 by the makers of weight-loss drink Slim Fast. His skinhead and Mohican styles both prompted a spree of copy-cat cuts from fans. But the Alice hairband the 28-year-old had been using to control Beckham's formerly flowing locks proved considerably less popular. Any imitators may have to suffer for their new style. Hairdresser Kim Johnson, whose salon specialises in Afro-Caribbean styling, said cornrows "can be a bit painful". "It has to be quite tight for it to hold," he told BBC News Online. 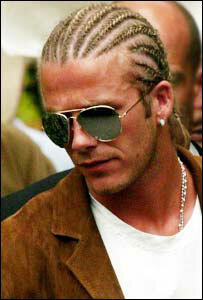 Manchester hairdresser Catherine Morris said her customers ask for Beckham haircuts soon after he unveils a new look. "When he had the Mohican all five year-olds wanted one," he said. Although cornrows might not be quite as popular. "Not all blokes have the length," he said. Willie Hendry, who has styled the hair of Beckham's wife, Victoria, said the styles could take a few months to appear as hair would have to be grown long enough to plait. By then the Manchester United midfielder may have grown tired of the weekly re-plaiting needed to maintain cornrows. "It will probably be a passing fad because it's a bit of a pain," Mr Hendry said. He added: "On a 15-stone (95-kilogramme) man with a fat face it wouldn't work." The Beckhams are seen variously as trend-setters or label-slaves but their efforts never fail to arouse interest among fashion addicts. 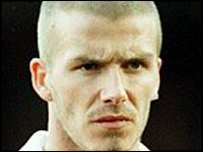 Tabloid photographs of Beckham wearing a sarong sparked a nationwide debate on whether men should wear skirts.